A painting by Pierre-Auguste Renoir, "Portrait of a Young Girl with Blond Hair", was stolen Saturday from an auction house in Saint-Germain-en-Laye, near Paris. Photo: PAUL J. RICHARDS. AFP. 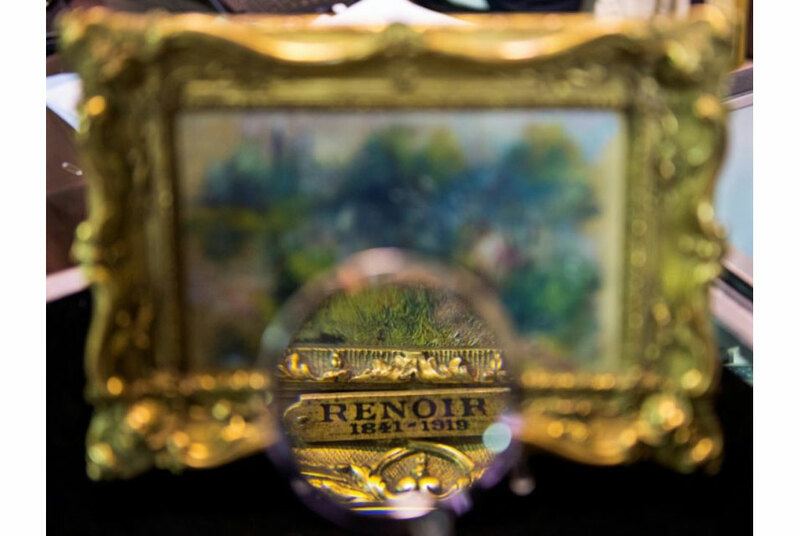 NANTERRE (AFP).- A small painting by French impressionist Auguste Renoir was stolen from an auctioneer in a Paris suburb on Saturday, the day before it was due to be sold, police said. "Portrait d'une jeune fille blonde" (Portrait of a Young Girl with Blond Hair), estimated at 25,000-30,000 euros ($30,000-$35,000), was taken from an auction house in the western suburb of Saint-Germain-en-Laye, where it was on display prior to the sale. The thief apparently just took the oil painting off the wall and escaped unnoticed, a police official said. The highlight of the sale, the canvas is listed in the auctioneers' catalogue as measuring 14 centimetres by 12.2 centimetres (5.5 inches by 4.5 inches), with the initials "A.R." in its top left-hand corner. Police hope video surveillance footage will provide a lead. Weatherspoon Art Museum opens "Louise Fishman: A Retrospective"